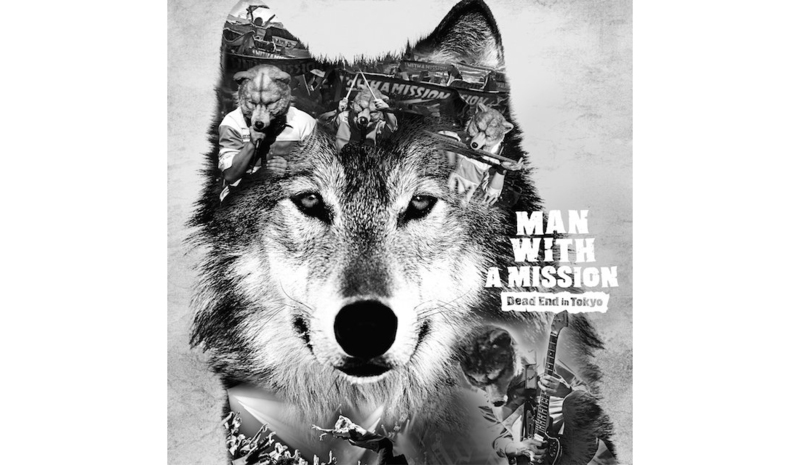 Man With A Mission is an alternative rock band from Japan, born in Shibuya in 2010 but… before going to talk about their new single “Dead end in Tokyo” I must do a brief introduction about this band extremely original and bizarre. The legend tells that in ancient times a crazy professor named Jimi Hendrix gave birth to a 5 pieces group resembling human beings but with wolves heads who, back then, wasn’t involved with music at all, but they were used by mean people in order to fulfil misdeeds of every kind. One day though the professor noticed that things were getting bad and decided to send the five wolves to the freezing Antarctica for punishment. Centuries passed by and the five creatures, already frozen, spent their time listening to all kind of music genres that were being played all over the world, deciding that, when the time of freedom would have come, they would have played music as well. Seven years ago, because of the greenhouse effect, the five wolves got free and defrost eventually, leaving the ice hell at last, choosing Japan as their main destination in order to begin the long musical journey… with a mission. The album I’m going to talk about is their first signed by Epic Records, a fine mix of rock, pop, electronic music and a little bit of house music here and there, all stirred with other genres that only a few were able to do so far, paying attention to every single detail and forming something amazing. I feel compelled to particularly highlight the track that gives name to the single album “Dead end in Tokyo”, with its hard rock rhythms combined to a dance and electronic sound, making the tune fluid with an easy imprinting, basically one of those songs that, since the first listening, can easily stick to your brain until explosion. Background to this chaotic mix of frequencies is Tokyo, frenzied capital city of the “land of the rising sun”, multi-ethnic society and hub of different cultures that come and go every day, giving the city its being unmistakably magnetic. Music and lights you can hear only in Tokyo, where most of the gaijin (Japanese term for foreigners) without sagacity are not able to perceive every little dark side the city shows only to careful beholder. It is about this matter that “Dead end in Tokyo” talks: a place where, if you are not careful enough, you get trapped into a vortex where rich people try to instil their obsolete life styles to the poorer ones who grab onto dear life like there’s no tomorrow. Or to all those people who are there hoping to have their dreams coming true, but probably waking up one day and fining themselves inside a hole from which they won’t be able to escape. A noteworthy piece by the book, as I would say, sung fully in English (compared to other tracks half in Japanese and half in English) that reminds me about HardFi album “Killer Sound” (another amazing work!). All the following songs are very peculiar, each one with its own defined character, but you just have to listen to the whole pack to get what I mean and you won’t be disappointed. MWAM definitely have cracked out an almost perfect EP, a fresh touch finally giving something new to the international pop/rock music scenery.